What Were The Least (And Most) Corrupt Countries In 2015? : The Two-Way The U.S. lost three points from its 2014 score. Despite gains in some countries, an annual index shows that 68 percent of the world's countries have "a serious corruption problem." An image from the Corruption Perceptions Index shows the U.S. with a score of 76, on a scale of 0-100. The top spot (judged the least corrupt) was taken by Denmark, with a score of 91. No country is free of public corruption, a scourge that has wide-ranging effects on the lives of billions of people. But in 2015, more countries saw drops in corruption than those that saw gains, according to the new Corruption Perceptions Index. The United States lost three points from its 2014 score, but the country kept its No. 16 ranking, tied with Austria and just ahead of Hong Kong. The top spot went to Denmark, followed by Finland. North Korea and Somalia tied for last place — a spot they shared in last year's index, as well. Despite improvements in some countries, the index finds that 68 percent of the world's countries have "a serious corruption problem. Half of the G20 are among them." "To stamp out the abuse of power, bribery and shed light on secret deals, citizens must together tell their governments they have had enough," said José Ugaz, Chair of Transparency International, the group which released the annual index Wednesday. 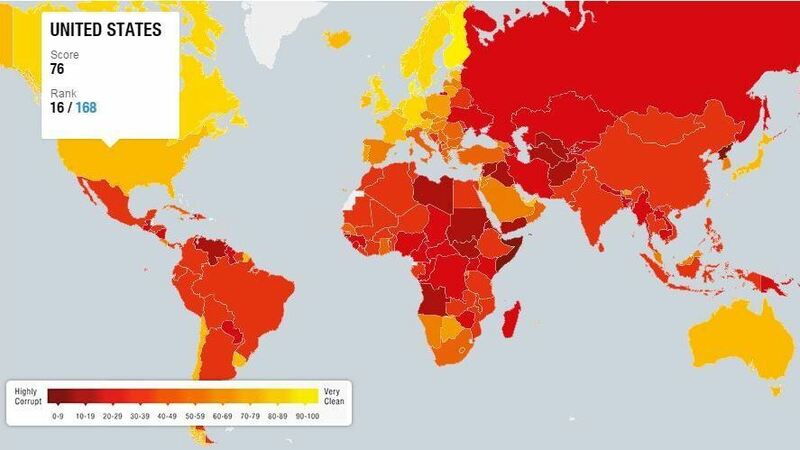 A map shows countries with the most corrupt public sectors in dark red, followed by orange and yellow — which "are perceived as cleaner, but not perfect," according to the group. Brazil, which is preparing to host the Olympics this summer, saw the biggest decline, dropping seven spots to No. 76 after losing 5 points from the previous year. Some of the gains in 2015, Ugaz says, came because citizens used street demonstrations to protest corruption. But even with those improvements, two-thirds of the 168 countries in the index still scored below 50, on a scale where a score of 0 means a country is perceived to be highly corrupt and a score of 100 is for countries that are perceived to be very clean. A widely cited indicator of corruption, the index from is built using surveys and assessments of corruption that were collected by institutions. The scores reflect conditions within countries' borders; Transparency International notes that even high-ranking countries can be linked to corruption overseas. The group cited a study that found "half of all OECD countries are violating their international obligations to crack down on bribery by their companies abroad." The OECD, we'll remind you, is the Organization for Economic Co-operation and Development.